When a machine component is subjected to a load (Static or dynamic load), it will experience the bending along its length due to the stress induced in it. This stress is known as Bending stress. Besides, there are other types of stress are also induced. they are Tensile stress, Compressive stress, Shearing stress, Bearing stress, Torsional stress. In this case, we supposed to consider the beam subjected to pure bending only. 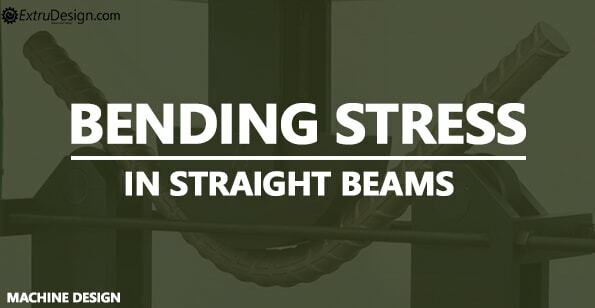 Bending stress is the normal stress induced in the beams due to the applied static load or dynamic load. The study of bending stress in beams will be different for the straight beams and curved beams. In this article, we will discuss the Bending stress in the straight beams only. Consider a straight beam which is subjected to a bending moment M.
While bending in the beam, the fibres in the upper side in the beam tend to compress (shortened) whereas the fibres in the lower side tend to elongate. In between somewhere these upper fibres and the lower fibres, few fibres neither elongate nor shortened. This part of the surface is known as the neutral surface. The intersection of these neutral surfaces with any normal cross-section of the beam is known as the Neutral Axis. M = Bending moment at the given section. I = Moment of inertia of the cross-section about the neutral axis. E = Young’s modulus of the material of the beam. R = Radius of the curvature of the beam. Here E and R are constants, therefore within the elastic limit, the stress is directly proportional to the distance between the neutral axis and the fibre (y). Where Z is the section modulus. The neutral axis has considered to always pass thru the centroid of the beam. For symmetric section beams, it is a bit easy to find out the bending stress as we mentioned, if it is an unsymmetrical section then centroid of the beam has to find. then we need to find the distance of the extreme fibres for both lower and upper fibres.